You've made all of your holiday plans, baked your famous fruitcake and sent out invitations to your annual holiday festivities. But, in the rush of the holiday spirit, have you forgotten your four-legged friends? Dangers to your feline and canine companions abound when holidays and festivities come around. Keeping your pets safe over the holidays, especially when you are traveling or visiting relatives can be a bit easier if you have a reliable home security system. Securitycompanies.com is a valuable resource to compare what different home security companies can provide. Whether you are worried about a water pipe break, a fire or break-in, there are many ways to protect your home and pets when you're busy with holiday events. A lit Christmas tree is a fire hazard whether you have pets or not. There is always a risk the tree could be toppled, or an electrical cord could be chewed. Setting your tree in a corner, and having a secure base for the trunk will reduce the risk of damage. According to PetMD, you should tape any exposed indoor or outdoor wires to a wall or side of the house to prevent electrocution. The U.S. Fire Administration claims that 230 fires a year are caused by Christmas trees. Keeping track of your pets when you're out of town is something that will make most homeowners rest easier. While having a collar and tags is essential in case your furry friend wanders while you are out of town, microchipping your pets is the best way to ensure your lost pet returns home safely. Holly, mistletoe and poinsettia are favorite holiday plants that are poisonous if ingested. Keep all of your holiday foliage out of reach of pets and children. Resist the urge to put edible Christmas tree decorations on your tree. Your pet may not understand they're not to be eaten. Never leave lit candles in your home. One wag of your cat or dog’s tail can send a candle tumbling and light your house on fire. Keep pets away from your holiday present wrapping activities. Ribbons, bows and strings can be ingested and cause veterinarian assistance to remove. Chocolate. Do not give your dog chocolate, even in brownies or cookies. While your cat probably wouldn’t care, your dog could get poisoned. If you do decide to travel during the holidays and leave your pets at home, consider hiring a professional pet-sitting company. 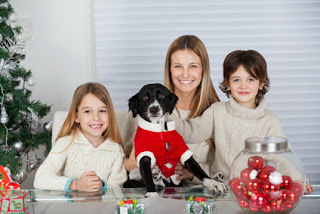 Organizations like the National Association of Professional Pet Sitters screen pet sitters to ensure your pet is cared for while you are enjoying your holiday activities. Many of these work for cats too. Thanks! Great tips. We are starting now to get everything sorted nice and early. Have a serene Sunday and get in some big easy today. Those are great tips for all pets! Thank you for sharing this informative and important information. Haopee, how are you and your dogs doing these days? Great tips! Have a wonderful Sunday!